Good afternoon. I am truly honoured to join you here today at the signing ceremony to witness the academic collaboration between the University of Hong Kong and Tohoku University for the establishment of the Centre for Transformative Artificial Intelligence/Robotics Technologies, or TransART. In fact, we have witnessed recently a number of MoUs on research collaboration between our local universities and top-notch research institutions from around the world. Today, I am pleased to witness the signing of another MoU between two world-renowned universities. Tohoku University is not only prestigious, but is also well known for its long-standing achievements in robotic technology innovation. Tohoku University has successfully translated its research outcomes into many practical applications for the advancement of society. On the other hand, HKU's Advanced Robotics Laboratory has also been promoting multi-disciplinary and impactful research in robotics. I am confident that collaboration among the scientists and researchers from these two distinguished institutions will bring about many more successes in the TransART area. Developing Hong Kong into an international innovation and technology (I&T) hub is a policy priority of the current-term HKSAR Government, and we have earmarked significant resources amounting to around HK$100 billion, to enhance Hong Kong's I&T ecosystem. The Government has been stepping up efforts in promoting I&T along the eight major areas set out by our Chief Executive, one of which is increasing resources for R&D. In addition, a super tax deduction of up to 300 per cent for R&D expenditure incurred by private enterprises has been introduced. We have also launched the Technology Talent Admission Scheme to facilitate tech talent admission from outside Hong Kong, and the Postdoctoral Hub as well as the Reindustrialisation and Technology Training Programme to provide funding support for recruiting postdoctoral talent and training our workforce in advanced technologies. True innovation comes from collaboration. Our vision is to make Hong Kong the hub for global research collaboration. We are working at full steam to build two research clusters focusing on healthcare technologies or Health@InnoHK, and an AI and robotics technologies cluster or AIR@InnoHK, at the Hong Kong Science Park. These are areas where Hong Kong has strength and potential in our pursuit of innovation and technology. We hope to leverage the strengths of our local universities and attract the best I&T researchers from around the world to collaborate with us. We can thrive further with our strong fundamentals. I am very happy to say that this exciting initiative has received enthusiastic responses from the top universities and research institutions all over the world. 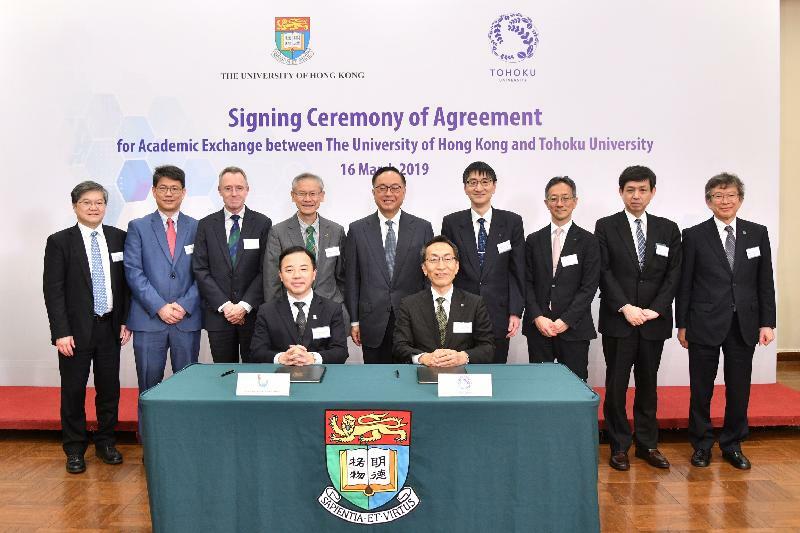 I am also delighted to know that there is serious interest in this initiative from the collaboration between Tohoku University and HKU. I sincerely wish the two universities great success in the upcoming collaboration. Thank you very much.